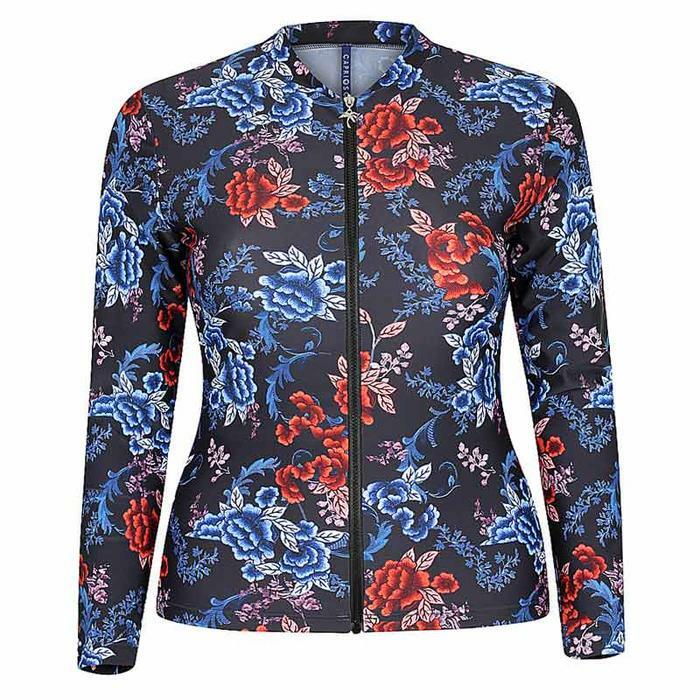 Sun safety is something we all want but it doesn't have to be boring as you can see with this womens rash shirt in a beautiful print of navy and red with pops of white. Be sun safe and look great! Adjust the zipper and show off your swimsuit top underneath, or keep it fully zippered for complete coverage. Full length sleeves and high neck for ultimate sun protection. Longer length to cover bottom and hips. Gorgeous print that's so easy to team it with plain swimsuits; there is a matching tankini and four different one piece styles if you prefer to keep it in the family. Size - Available in sizes 10-26 (while stocks last); Need a hand to find your size? Then go to the Size and Fit Tab to the right and all will be revealed.